Creative sandwich ideas make lunchtime more fun for kids. Sandwiches may well be the easiest type of lunch to make, but that does not mean it has to be boring or bland. A sandwich is, however, just a sandwich until you do something special with it. Here are some great sandwich ideas to make a simple sandwich more interesting. Use a cookie cutter to cut a shape out of the center of one slice of bread. Using a second whole slice of bread, make any type of sandwich, making the last layer a slice of cheese. Top with the cut out slice of bread. You can use the same idea for making grilled cheese sandwiches. Or, you could cut out eyes, nose, and mouth to make a face sandwich. For this sandwich you will need thinly sliced carrots dropped in ice water so they curl, 2 inch slices of celery cut in thin strips, and raisins or chocolate chips. Make a regular sandwich, but before adding the top layer of bread, place a slice of celery on each of the four corners of bread (this will form the legs). Add two carrot curls upright to the top layer of bread to form antennas and raisins or chocolate chips for the eyes. Spread peanut butter on one slice of bread. Let the children use raisins or chocolate chips to form faces. Butter slices of bread, and lie them face down on a cookie sheet. Use scissors to cut circles, squares, and rectangles in assorted sizes out of the cold cuts and cheese. Let the children be creative and place the shapes on their bread to form houses and cars, etc. Put the cookie sheet under the broiler for a couple of minutes until the cheese starts to melt. Cool before eating. Fry an egg, breaking the yolk, until almost done. Top with a slice or two of deli ham, and a slice of cheese. When the cheese is melted, place between two halves of a toasted English muffin. This also works well with croissants. OR, toast English muffins, spread with peanut butter, and top with banana or apple slices. Make mini submarine sandwiches using hot dog buns. Use cheese, mayo, and tomato on whole wheat bread. 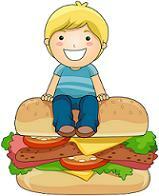 Offer a variety of fillings and soft hamburger buns and let the children create their own sandwiches. Make sandwiches out of chopped cooked chicken and mayo with crunchy lettuce. Cut whole wheat bread into triangles. Make triangle sandwiches with the filling of your choice. Then… add raisins for eyes, pretzels for antlers, and a cherry tomato for the nose. Make a grilled cheese with tomato slices and bacon inside. OR... Grill two buttered slices of bread, and instead of cheese... spread peanut butter on the inside and top with thinly sliced bananas. Grill as usual. This is a sandwich idea sure to be a hit.